A chief minister in India is identified as the head of a state government and the governors are recognized as the constitutional heads of the states. The Indian Constitution has given most of the political power to the chief minister, but the governors are also empowered with some special power under various provisions of the constitution. While a chief minister (with his council of ministers) of a State is directly accountable to its citizens, the governors are normally made accountable only to the President of India. There are plentiful examples in India, where the difference of opinions between a chief minister and governor has made the political equation sour. The governors are usually kept above the public sphere. But some times, the governors virtually shed negative influence in the socio-political development of a State. In reality, those governors serve the vested interest of some strong lobby of the Union Government, which is against the spirit of the constitution. The repeated appointment of the Army Generals as the Governors of many Northeastern States raises the vital question, whether New Delhi prefers to maintain a second epicenter of power in the States, notwithstanding for the interest of the Nation. The appointment of Gen (Retired) Joginder Jaswant Singh as the governor of Arunachal Pradesh on January 24 has stimulated the same question among the conscious citizens of the trouble torn region. Retired from service last year, Gen Singh, who was honoured with the Param Vishisht Seva Medal (PVSM), Ati Vishisht Seva Medal (AVSM) and Vishisht Seva Medal (VSM) during his four-decade long career, has joined two serving governors in the insurgency stricken Northeast, who are also from the defence background. Lieutenant general (retired) Ajai Singh, PVSM, AVSM took over the responsibility as the governor of Assam from another lieutenant general (retired) four years back. The former Assam governor SK Sinha was transferred to Jammu and Kashmir. Another lieutenant general (retired), who has been serving Mizoram, is MM Lakhera, PVSM, AVSM, VSM. On the other hand, Tripura has a retired Indian Police Service official, Dinesh Nandan Sahaya, as its governor. Thus four states (out of eight) in the Northeast have their governors from the background of ‘man in uniform’. The governor under the provisions of the Indian Constitution enjoys the right to be kept informed of all major decisions adopted by the state government. Moreover, the governor appoints the chief minister and also appoints the council of ministers of the state following the advice of the chief minister. The governor summons the state legislature and also dissolves the legislative assembly. He addresses the legislature. Each and every bill passed by the state legislature must be endorsed by the governor before it becomes law. In a particular situation, the governor can send a report to the President of India that may invite the President’s Rule after dissolving the state legislative assembly. However, there are plentiful examples in India, where the difference of opinions between a chief minister and Governor has made the political equation sour. 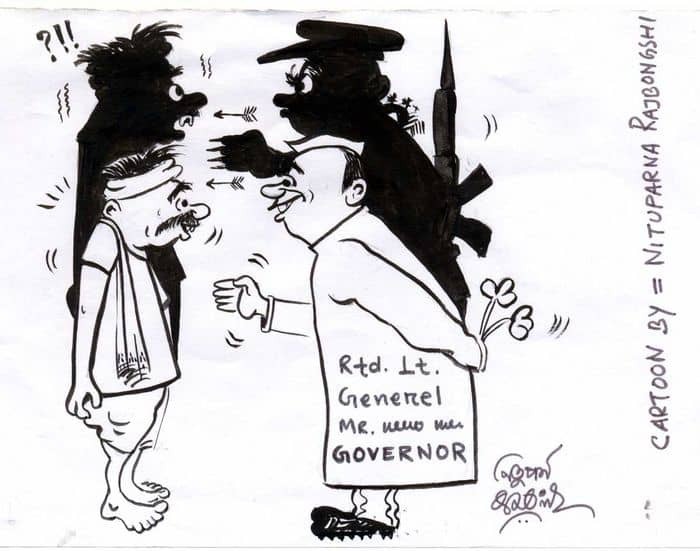 The governors are usually kept above the public sphere. But sometimes the governors serve the vested interests of some strong lobby of the Union government, which is against the spirit of the Constitution. The repeated appointment of the Army Generals as the Governors of many Northeastern states raises the vital question, whether New Delhi prefers to maintain a second epicenter of power in the states, notwithstanding in the interest of the nation. “In the insurgency-hardened Northeast, democratic India has developed a defacto political system, somewhat autonomous of the formal democratically elected governmental structure. This parallel system is an intricate, multi-tiered reticulate, with crucial decision-making, facilitating and operational nodes that span the region and connects New Delhi with the theatre of action,” argued Sanjib Baruah, an Assamese scholar of international repute. Mr. Baruah, who now teaches in IIT Guwahati also added that New Delhi’s containment policy of the last few decades in the militancy affected Northeast produced ‘a peculiar equilibrium, one in which democracy and authoritarian governance coexist with disturbing ease’. The restive Northeast region, surrounded by Nepal, Bhutan, Tibet (now under Chinese territory), Burma and Bangladesh, is tenuously connected to the mainland India and has long been beset by numerous insurgencies. Bangladesh juts up to the north from the Indian Ocean, nearly severing the region’s eight states from India itself. Scores of rebel groups in the area have been fighting the government virtually since India’s independence from the British. The Northeast has a volatile stew of militant organizations, most of them ethnically based. According to some counts, there are as many as 35 such groups in the region, some of them Islamist. Armed groups use the jungles of southern Bangladesh and northern Burma as their hideouts and training camps. The land-locked region has slowly turned into a land of extortion, explosions and assassinations by the militants. New Delhi has also responded to the restive region with ambitious efforts to build infrastructure. The famed Stillwell Road, which passed through some of the toughest terrain in the world during World War II as a vital link between Burma and India, is being rescued from ruin and will be reopened and repaved. In 2001, the then Indian Foreign Minister Jaswant Singh inaugurated the construction of a road connecting the Burmese towns of Kalewa and Tamu with Moreh in Manipur, one of three historic trade routes linking the Northeast to Burma. Moreover, New Delhi has created a separate ministry for the region and begun building a wide range of infrastructure projects, public resentment against the central government remains high. Indigenous activists complain that the government is only interested in exploiting the region’s oil, coal, tea and timber resources while remaining deaf to their needs. New Delhi is definitely worried with the development and many times it has gone trouncing the elected state governments of the region, whenever the question of territory has emerged. One Member of Parliament from Assam once told in a public meeting that the Union government was more concerned about the territory of the country than even the people living there. One classic example that reflects the attitude of New Delhi towards the people of Northeast is the Armed Forces (Special Powers) Act, 1958 (AFSPA) which has been in force in the region for five decades now. The AFSPA empowers the security forces to arrest people without warrant, and use excessive force (including shooting or killing, even if the lives of the members of the security force are not at imminent risk). It facilitates impunity because no person can initiate legal action against any member of the armed forces for anything done under the Act, without permission of the central government. It was first applied to Assam and Manipur and later amended in 1972 to extend to all northeastern states. A northeastern lady has raised the voice against AFSPA with a unique way. The young Manipuri lady started her hunger strike in November 2000 and unbelievably enough; she has been continuing her fast till date. In fact, Irom Chanu Sharmila has changed the face of protest in the insurgency stricken region with her non-violent agitation against a black law. Now surviving on nasal feeding, Sharmila has already been recognized as a mesmerizing agitator by the human rights activists from different parts of the globe. Presently kept in a security ward of a local hospital in the Manipur capital, the iron lady, who takes inspiration from the Father of Indian Nation (Mahatma Gandhi), has already booked a place in the Guinness Book of World Records as the longest surviving fasting individual in the world for a social cause. Sharmila also won the ‘2007 Gwangju Prize for Human Rights’ (South Korea). Dr. Sandeep Pandey, a Magsaysay Awardee expressed deep anguish that New Delhi had ignored the recommendations of a recent committee to repeal the black law. The Justice Jeevan Reddy Commission (2004), which organized public hearings in various parts of Northeast, recommended the repeal of AFSPA, but the government was not convinced. Earlier, Veerappa Moily Administrative Reforms Committee also favored the same initiative in vain. It will be a real difficult task to find an example anywhere in the democratic world, where a black law like AFSPA could continue for such a long period even after popular uprising against it. AFSPA simply violates the Indian Constitutions in regard to right to life, the right against arbitrary arrest and detention, the rules of the Indian Criminal Procedure Code relating to arrests, searches and seizures, and almost all relevant international human rights principles. So whenever there is news of the appointment of a retired general as a governor in Northeast, the pertinent question that arises is whether New Delhi always prefers to treat the region as a war zone. As like in a battlefield, the Union government seems to make it a habit not to take the state governments into confidence in case of counter insurgency operations. And hence, the region has been poured with the ex ‘man in uniform’ as the constitutional heads of the states, so that New Delhi continues to enjoy the last say in managing (?) the troubled zone, where larger section of conscious population still nurture anti-New Delhi sentiment even after 60 years of India’s Independence.